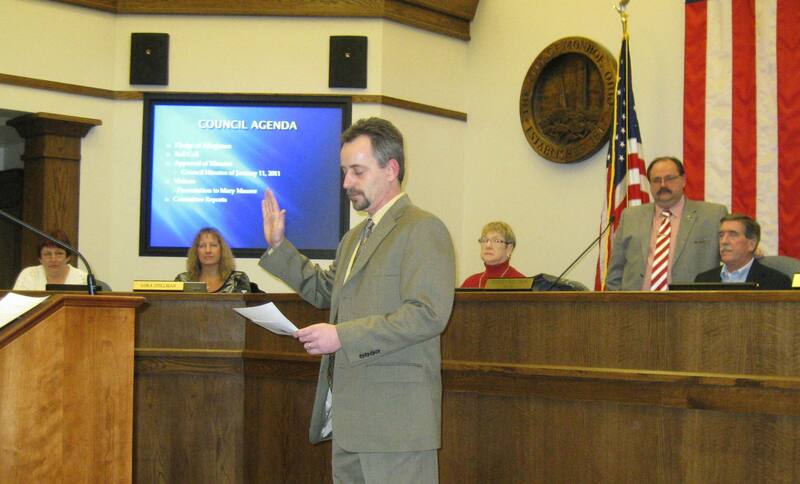 Photo: Steve Black Swearing in with Council looking on. Everything you need to know about the candidates and the issues will be right here on The Voice, including opinions and thoughts directly from some of the candidates. All election results will be posted here, just as it has been for the past 10 years. We will be posting more archive video of the incumbents so you can get a better idea of how they legislate. We have never before seen video footage, photos and information that go back to the previous term on all the candidates. Also there will be some shocking satyr you won't want to miss! We will continue to post information about Issue 2. 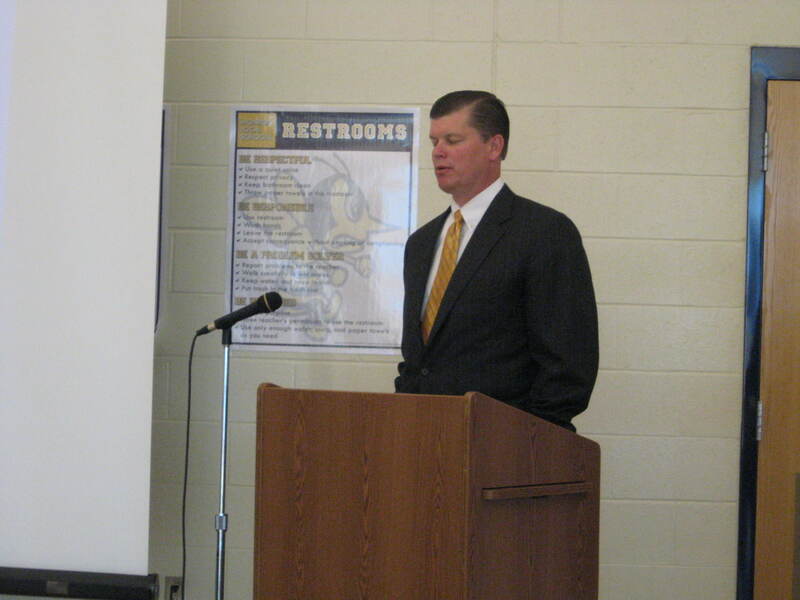 2008 Photo: Rob Smyjunas of Vandercar Holdings, Inc. Mr. Smyjunas made a $125K payment to Monroe schools in exchange for having his property abated 100%, a move that was fought by the Monroe School Board in general and Tom Birdwell specifically. When asked about the impact on schools, then Monroe School Treasurer Kelley Thorpe replied, “ I do think if we can get the agreement hammered out and finalized, it will be a good deal for the school. The city will get to give their abatement, but the district won’t suffer financially for it. “ Subsequently, Mr. Smyjauas and his Vandercar Holdings, Inc. declared bankruptcy. The city and the schools get no income from the project. We have 4 council and 2 school board seats that have to be filled. Everyone will need to know how to vote so, endorsements for those seats will be coming out in the next few weeks. These endorsements in part will be based on opinions from posters, so Voice your opinion liberally. We all need the information. Council Candidates Black and Dame as well as School Board Candidates Birdwell and Leeds have their own threads. Others have been discussed on here everyone and every issue will ultimately get a thread. For the past decade Main Street Monroe has been the place to read up on the issues, candidates and hear a debate from the community. This year we have more information, video and graphs. We hope to assist all voters with info to help them have an informed opinion. 1. Transparency - this is perhaps the most important thing at all. How transparent will the candidate like operate? Will there be a push to hve committee reports? Will the candidate support minimal emergency legislation? Will the candidate likely share information on his blog, Facebook page, or here on The Voice? Or will there be another surprise like what we had this year with the schools or 7 years ago when the city was declared in a fiscal emergency. In both cases (school and city) we were not properly informed of finances properly. With the professional media all but gone, voters need to rely on information from or representatives. 2. Experience - not just experience as an elected official (that counts too) but also experience outside of government. We are looking for candidates who rule by experience rather than emotion. Even if we disagree with a candidate on an issue as important as SunCoke, experience will play a more important role. 3. The specific issues - We will ask each candidate questions on specific issues. If an opinion is not provided, the voting record for incumbents will be used. We ask, does the candidate represent us on most of our Monroe community concerns? Is the voting record consistent with the goals of the entire Monroe community? Or so special interest groups have the candidates ear and future tax dollars? 4. Community Cooperation - Will the candidate likely extend olive branches to Middletown, Trenton and Butler County? Will the candidate likely help Monroe mend relationships with our neighbors and county? Will the candidate work with economic development groups such as the chamber and Cincinnati USA? Will the candidate extend the olive branch to businesses by helping promote them on their website and other internet media? Will the candidate promote links to events on the city facebook page? 1. Are you for or against SunCoke? -Would you continue the fight against SunCoke? -would you continue to fight Butler County on this issue? 3. Would you support a tax increase? -How would you balance the budget if you are against tax increases? 4. What would you do if elected to make Monroe a better place to live? 5. What are your thoughts on tax abatement's? -Do you think warehouses should be abated at 100% for 15 years? -What is the maximum abatement Monroe should allow? -Are you aware that abatement hurt our school funding? 6. Do you think there should be more transparency on council? -Should council have fewer executive sessions? -Should there be so many emergency legislation agendas on council? - Should council committees report at least once per year to council in public? 7. What is your involvement in the community? 8. What would you do to help improve our relationship with Middletown and Trenton? Or should we not worry about our neighbors? 9. Are you in favor or against membership in the Chamber of Commerce? -If in favor, will you participate in Chamber of Commerce Events? -If against, what would you join other chambers? 10. What can Monroe do to be more attractive to business? What would you to to improve the chances that a business would choose to locate to Monroe over another site? 11. Will SB5 help Monroe Council better manage it's budget or does SB5 have no effect on Monroe's ability to control labor cost? 1. How did we ever get into this financial mess? Please state any facts you know about the situation. 2. How will you help us get out of this financial mess? 3. How well is the superintendent doing? Rate 1 to 10, 10 being highest an tell us why you rated her what you did. 4. Why are you running for school board? 5. What do you think about the 100% abatement deals, should Monroe Council do more of them? 6. Will Monroe Schools be polluted if SunCoke goes full operation?